CH7600 series controls offer options that mosts top mount controls in the market do not. Options like trim (most outboards) or trim and tilt (most stern drives) or the newly released neutral lock out button. The lock out button is great for center console boats where there is a possibility the control can be bumped while passing by knocking it into gear. The standard items on these controls are the shapely and balanced hand grip that gives you a very smooth yet solid feel. The neutral safety switch, and the neutral warm up button. These controls can not only use the 3300/33C style control cables they can also use Mercury style cables from 1965 to date including the Gen II, OMC/Johnson/Evinrude/BRP control cables from 1979 to date. This makes it one of the most desirable replacement controls in the market today. 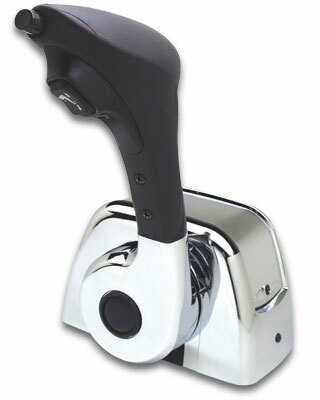 Dual-function control – one lever controls throttle and shift. • Superior feel and function for most outboards, stern drives & inboards. • Dual function lever controls both throttle and shift of one engine. • Neutral safety offers start-in-gear protection (standard). • Optional Trim in the handle for each model. • Neutral engine warm-up feature (standard). • Optional tilt switch available. • Friction adjustment feature included. • “Easy-On” cable design accepts virtually every type of OEM and 3300/33C type cable. • Easily adapted to push or pull cable actuation mode.